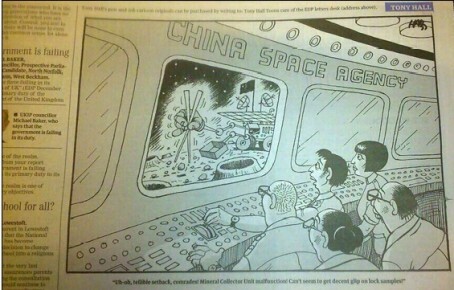 A regional daily has apologised after its cartoon of a Chinese space craft holding chopsticks was branded racist by some of its readers. However, the cartoon’s space rover is holding a pair of chopsticks while its buck-toothed control room staff mispronounce several words. The cartoon, a reference to China’s Chang’e-3 spacecraft touching down safely on the lunar surface the weekend before last, prompted an angry reaction from some readers. Several readers took to the Archant-owned newspaper’s social media sites to voice their discontent with the cartoon. Ben Halliday added: “There is a world of difference between a contextual parody, and printing an image depicting a Chinese man with big teeth using the word “tellible”. Some readers took the paper’s side, however, suggesting that Chinese people would not have been offended by the cartoon. Marc Coker wrote: “It was stupid to print it, and a bit 1960s sitcom, but on the reverse side if Norfolk had landed on the moon and there was a cartoon with a tractor and some comedy Norfolk dialect would you complain? It wouldn’t bother me. Following the backlash, EDP assistant editor David Powles posted an apology on the newspaper’s Facebook and Twitter pages. He wrote: “The cartoon was clearly meant as a parody, much in the same way of many comedies seen on TV, eg; Allo Allo, the Kumar’s at Number 42, Alan Partridge etc etc – where fun is poked at language in different ways. “However it has clearly struck a nerve with several people and if it has offended anyone, we wish to apologise – that was not our intention. A spokesman for publisher Archant Norfolk added: “We have already apologised in print and online and are sorry that we published the cartoon. It was a misjudgement and we have put procedures in place to make sure that it does not happen again. Query. How many of the offended parties complaining about this where actually Chinese? Dunno why it needed a caption. The thought of a Chinese robot gathering mineral samples with chopsticks would surely have been funny in isolation. Saying that, I remember when a dopey sub put ‘Jap’ in the headline when the first Japanese bank came to Birmingham, and the bank didn’t speak to the Evening Mail from that day on. Xenophobia rather than racism surely? David Powles’ supposed apology reads much more like an attempted justification: “We’re sorry if you don’t have a sense of humour”. Bad judgement to publish in the first place, and badly handled afterwards. I heard Norwich City have just signed a couple of Chinese players. We-won-once and how-long-since! Doubt if anyone Chinese complained. They probably sighed deeply with frustration & carried on – they’ve been at the receiving end of bad jokes like that for ever. Now, if it had been a Muslim joke – say, if an Iranian Moon rover had found the moon’s green cheese to be non-halal, for instance – not only would it never have been published, it would probably never have been drawn, and had it been there would have been howls of rage from the Muslim community. This does not mean that the Chinese cartoon is any less racist; it means that even if no-one of the insulted race objects we shouldn';t insult them with racist cartoons. The apology from David Powles was funnier than the cartoon. Why, exactly, should we not poke fun at other nations ? Indeed the Chinese, in particular, do a lot of things that I find offensive. Do they care what I think ? Not a jot. Do I care if they are equally offended by such a mild parody of their race ? No. But they haven’t even bothered to complain anyway. The English people offended on behalf of the Chinese are just trying to polish their PC haloes in public…a very unappealing, disingenuous modern trait. The cartoon is offensive, the apology is worse – surely a lesson in how not to do social media. Either have courage in your convictions and stand-by the cartoon or offer an unqualified apology. Using weasel words to say “we’re sorry you didn’t get our not very funny joke” is an insult to readers. This is like a child who’s been caught out and is not man enough to acknowledge their mistake. Pathetic. Have we lost our sense of humour? If a French newspaper published a cartoon portraying Le Ros Bifs it would not worry me in the least. Racist? Not a bit. Several, eh? And what is the EDP’s circulation? It’s a pretty dumb cartoon but the complaints should have been publicly ignored while a gentle word held with the artist in private. Thanks for your feedback on here, believe me I have personally learned a lot from this incident. One thing I will say, at least I had the guts to come out and try and apologise in person – whether you felt it was done properly or not. All too often on this site it staggers me how quick people are to condemn – but only when hiding behind anonymity. I must take exception with some of the comments suggesting only Chinese people have a right to be offended by this. How far would you extend that mentality? Only women can be offended by sexism? Only gay people can be offended by homophobia? Only Jews can object to the holocaust? Of course that is taking it to an extreme but it would be a strange, selfish and not very pleasant world where you are only allowed to take issue with things that have a direct impact on you. Chinese people probably wouldn’t complain – but only because this is relatively mild when compared to the kind of casual racism many experience on a daily basis. After a while you become weary and see no point in objecting. But that doesn’t mean they accept it and it certainly doesn’t mean it has a place in a mainstream newspaper. Well done to the EDP for apologising – it’s a baby step to a much nicer society where we don’t dismiss whole races of people based on ignorant, out-dated stereotypes. I’m just amazed any regional newspaper still has money to commission cartoons. Scope for some savings here, clearly, if that’s the best he or she can do.